I’m back in gorgeous Aldeburgh for a Britten-Pears Young Artist Programme course on Strauss songs and arias. It’s a pretty wonderful way to spend a week–sleeping in absolute silence, waking up to sounds of gulls, working all day on subtleties of music and German with immensely skilled and generous people, making a quiet dinner, walking on a rocky beach, going to sleep. Yesterday, on our day off, we toured Benjamin Britten and Peter Pears’ beautiful brick house and studio and gardens and archive; standing in Britten’s composition studio, looking out at his apple trees which were his view when writing some of his late pieces, was very special. 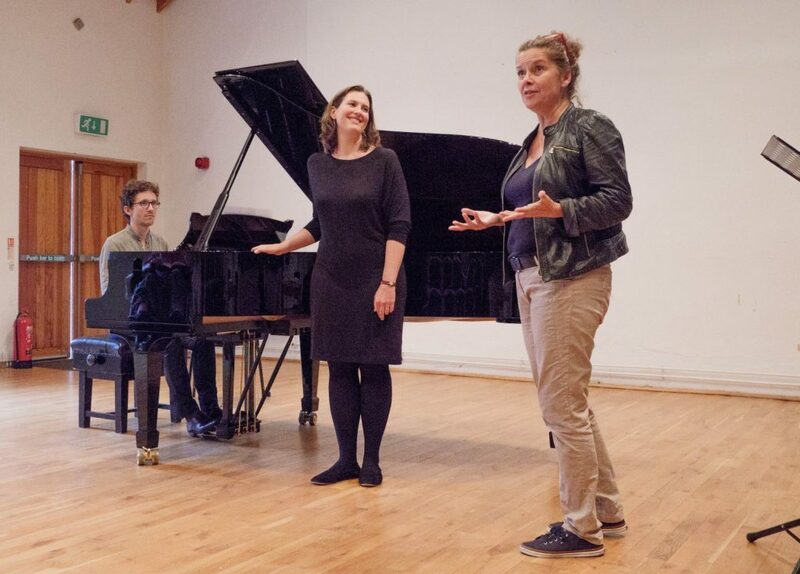 It’s hard to identify the best part of the week, or the most penetrating thing I’ve learned, as it’s all been amazing; but I was very forcefully struck by my first coaching with Angelika Kirchschlager, brilliant mezzo-soprano who is just as warm and genuine in real life as she is on stage, and this work has grown within me and begun to shape me a bit differently in the days since. Here are transcriptions of notes I frantically wrote down after that first session so I could remember some of her wisdom about performance, about text and music, about fearlessness and directness and honesty. You are a filter for something that is already made. The music exists. You don’t have to make it, and Strauss is your ally; but you have to be the most true and transparent amplifier for everything in the words and music, and for every single part of yourself–your history, childhood, loves, pains, disappointments–that informs the words and music. Be as personal and focused as you can at every moment. Don’t damp the amplitudes of your expression or of the music out of fear that it’s too much. The vowels don’t transport the passion! They have it, but the transportation is the consonants. If I can ever come close to matching her courage and warmth and directness (to say nothing of her immense beauty of sound), I’ll have succeeded.